Devices that have Android 4.0 and above can be backed up from the Android SDK and saved to a file on your PC. This process will allow you to have all of the data from your phone placed into a backup file on your computer. Install the latest version of the Android SDK Tools. If you already have Android Studio, open Android Studio and select “SDK Manager“. Check “Android SDK Platform-tools” and install the package. 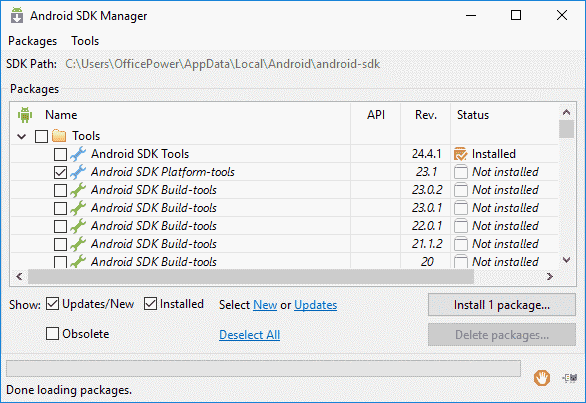 Launch SDK Manager, check the “Android SDK Platform-tools” option, then select “Install x packages…“. On your Android device, go to “Settings” > “About phone/tablet“. Tap “Build number” 7 times until it says “You are now a developer“. Under “Settings” > “Developer options“, set “USB debugging” to “On“. You can type one of these commands depending the type of information you’d like to backup. adb backup -all – System data, app data but not the apps themselves. By default saves device data to the platform-tools folder as backup.ab. adb backup -all -f C:\filenameichoose.ab – Same as above only you can set your own location for saving the backup file. For more information on the usage of this command, visit the XDA guide. Once you type a desired command and press Enter, the following screen should appear on your device. Provide a password for your backup. 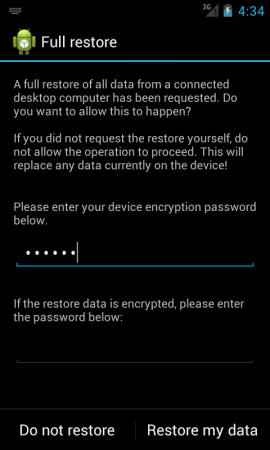 You will have to use this password if you have to perform a restore in the future. Tap Back up my data and the data should start transferring. You will then be prompted on the device for your password. i get “adb unable to open file c:\test\test.ab” when trying. Your article title is misleading, it should say “How to back up some files and the majority of the apps” this method does not back up the Android core files, text messages etc. The step by step instructions were simple to follow so I was able to get my phone backed up quickly. Thanks for not adding all the multitudes of details that could have confused the point of this article. 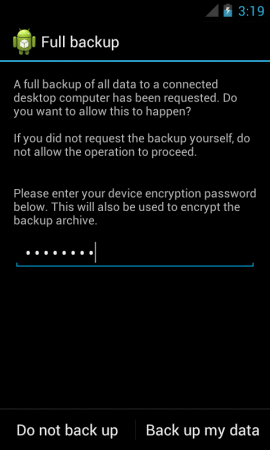 I wanted to backup the Android image of a Samsung S3 to a Windows 10 PC as a safeguard. This article appeared at the top of the search list. It took a few seconds. The backup file was stored elsewhere. The program Ransack retrieved it in the user’s partition in \appdata\local\virtualstore. All ok! This article links to a guide in the XDA forums which explains additional parameters, For example, how to backup also the application programs with their data. This is useful when one restores and a future application is incompatible with the current data format. This article served me well because it is short and to the point. Reading it was faster than typing this comment. Thank you, well done! I tried this on a alcatel one touch 5020T phone and got a backup size of 41 bytes. I tried using 2 tablets and a Samsung J7, which produced respectable size backup files. Looks similar to comments on 3/3/16 from Jan. Anybody know why it doesn’t work? This is the problem with articles like this one. They give you a sample that may or may not work for all cases, and rarely offer any kind of assistance with issues you may have when trying to implement it. My only hope is that someone will see this and know the solution.